Maximum efficiency and excellent performance. 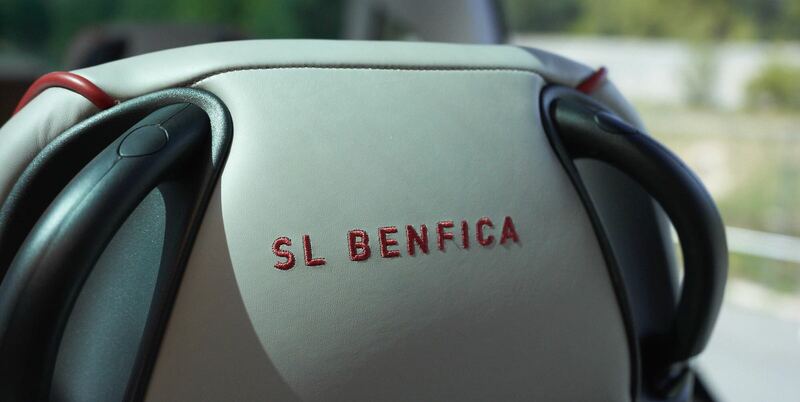 This is what is expected from any member of a football team such as S. L. Benfica, and the new bus acquired to MAN Truck & Bus Portugal completely fulfills all these requirements, providing also great comfort and several functionalities that will certainly allow all team and staff members to relax and be entertained in all their journeys. The NEOPLAN Skyliner was customized to the tiniest detail, considering all the team needs, at the MAN Bus Modification Center, where experts were in charge of equipping the new vehicle with the most innovative technology. 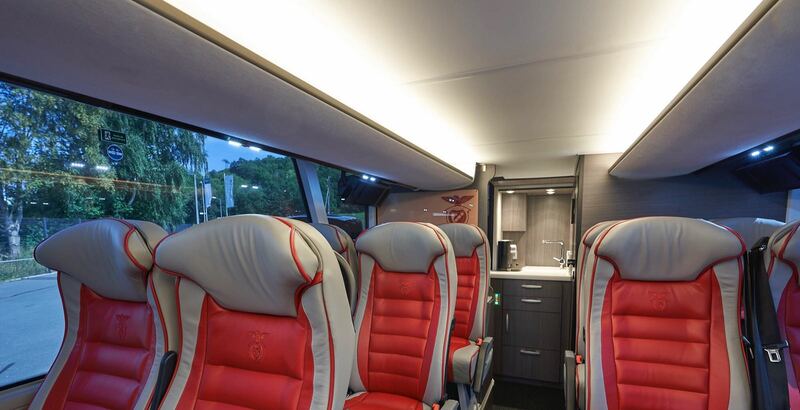 The lower deck is divided between a working area, with a meeting table and 16 comfortable seats, that is the ideal area for players, coach and technical staff to define the last details of their strategy to every game, in a sophisticated environment; there is also a high-end kitchen, equipped with a refrigerator and a ceramic hob, where it is possible to cook meals like in any state-of-the-art restaurant. In the lower deck all details were also taken into consideration: the space was designed to allow players to enjoy the essential moments of relaxation and concentration before every game. There are a total of 24 high-quality seats, each one with USB connection, power sockets and a monitor. The relaxing atmosphere is completed by the hi-fi equipment and multimedia system. The ideal temperature is always guaranteed, thanks to the dual-zone rear air conditioning system that can regulate the upper and lower decks individually, a convector heater and two step unit heaters. 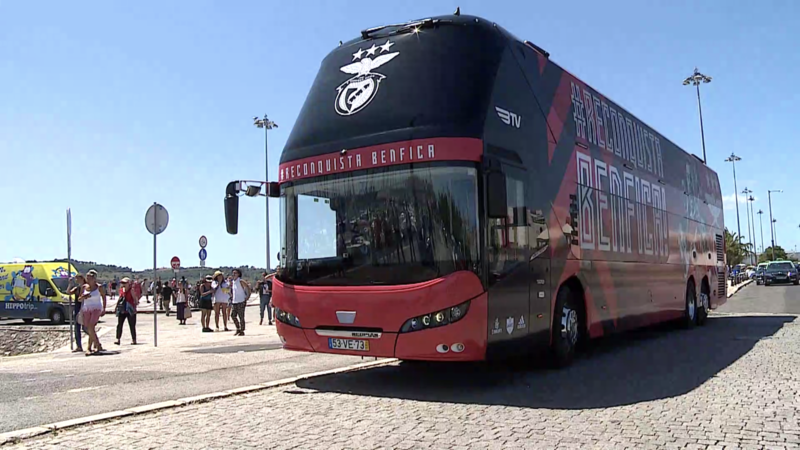 At the end of the match, the team can rest assured that when returning to the bus they will find it as cosy as when they left, thanks to the stationary air conditioning system with an electric air conditioning compressor in the luggage compartment. To assure maximum safety while on the road, the bus is equipped with the most recent and innovative assistance systems, including emergency braking assistance (EBA), electronic stability program (ESP) and a lane guard system (LGS), not to mention the electronically controlled shock absorbers of the MAN ComfortDriveSuspension (CDS). 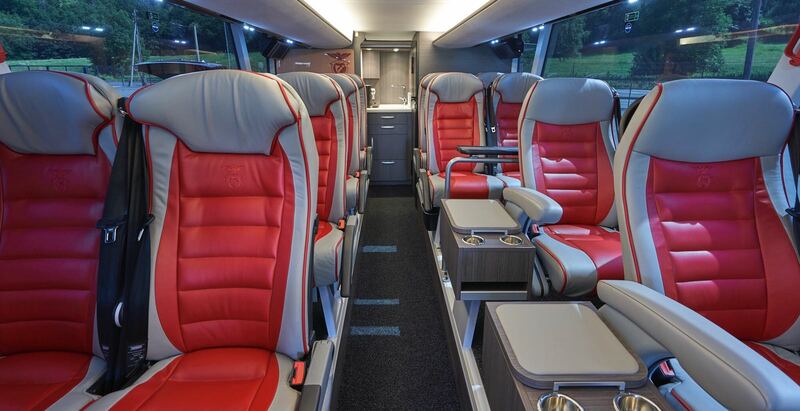 These all make sure that this very special double-decker is perfectly equipped for its tours throughout Europe. In addition to all the special equipment that helps make sure all trips are smooth and confortable, the NEOPLAN Skyliner is also equipped with a powerful and ecological engine that complies with the Euro 6 regulation. The 6 cylinder Common-Rail Diesel Engine with 12.5 litres and 500 hp, ensures that any road is easily travelled. Together with the engine there is an automatic gearbox with topographic cruise control to make the work of the driver simpler.